SCVHistory.com JD8003 | Newhall | 1980 SCVCC Western Celebrities Dinner Program (Walk of Western Stars Predecessor). 1980 SCVCC Western Celebrities Dinner Program. Odyssey Restaurant, Mission Hills | October 23, 1980. The predecessor of the Downtown Newhall Walk of Western Stars was an annual Western Celebrities event organized by Jo Anne Darcy on behalf of the Newhall-Saugus-Valencia Chamber of Commerce, which renamed itself "Santa Clarita Valley Chamber" in 1980 (even though Canyon Country would maintain a separate chamber for another 15 years). The event, held in the fall, was a star-studded luncheon from 1975-1979 and a dinner in 1980. After Darcy left the chamber in December 1980 to go to work for newly elected Supervisor Michael D. Antonovich, the Western Celebrities event was reborn in 1981 as the Western Walk of Fame, complete with bronze plaques in the sidewalks of downtown Newhall. (The Hollywood Chamber was not amused; the local name was eventually changed to Walk of Western Stars.) Darcy continued to serve on the organizing committee as part of her duties for Antonovich, who became honorary chairman. This, then, was the final Western Celebrities event prior to the changeover to the Walk of Fame/Stars. 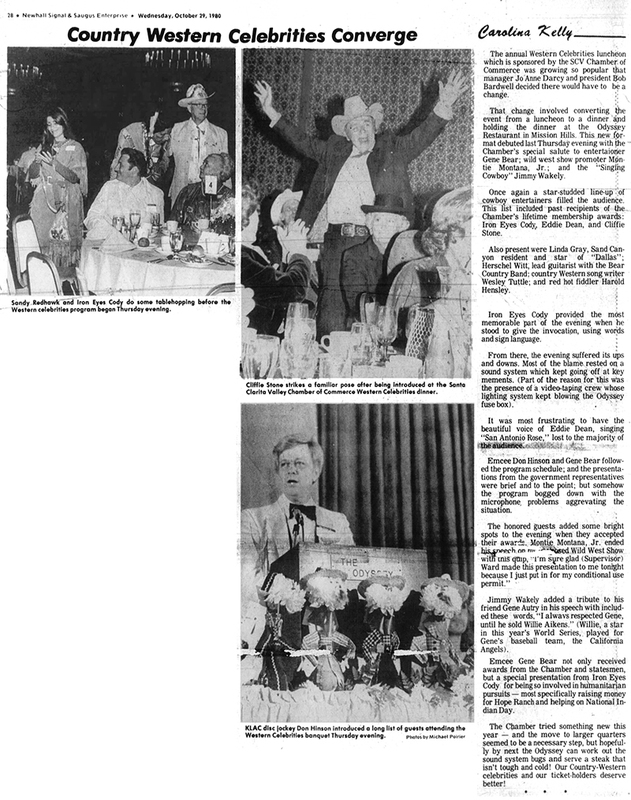 The 1980 honorees were Country music promoter Gene Bear, Wild West Show host-owner Montie Montana Jr., and Singing Cowboy-actor Jimmy Wakely. A fun time might have been had by all if not for some technical difficulties with the venue (see below). Darcy's program book autographed by the three honorees plus Iron Eyes Cody and his friend Sandy Red Hawk, Sand Canyon resident Linda Gray ("Dallas") and others. 7x8½ inches octavo, 8 pages. By Carolina Kelly (Linda Pedersen). The Newhall Signal and Saugus Enterprise | Wednesday, October 29, 1980. The annual Western Celebrities luncheon which is sponsored by the SCV Chamber of Commerce was growing so popular that manager Jo Anne Darcy and president Bob Bardwell decided there would have to be a change. That change involved converting the event from a luncheon to a dinner and holding the dinner at the Odyssey Restaurant in Mission Hills. This new format debuted last Thursday evening with the Chamber's special salute to entertainer Gene Bear; wild west show promoter Montie Montana Jr.; and the "Singing Cowboy" Jimmy Wakely. Once again a star-studded line-up of cowboy entertainers filled the audience. This list included past recipients of the Chamber's lifetime membership awards: Iron Eyes Cody, Eddie Dean, and Cliffie Stone. Also present were Linda Gray, Sand Canyon resident and star of "Dallas"; Herschel Witt, lead guitarist with the Bear Country Band; country Western song writer Wesley Tuttle; and red hot fiddler Harold Hensley. Iron Eyes Cody provided the most memorable part of the evening when he stood to give the invocation, using words and sign language. From there, the evening suffered its ups and downs. Most of the blame rested on a sound system which kept going off at key moments. (Part of the reason for this was the presence of a video-taping crew whose lighting system kept blowing the Odyssey fuse box). It was most frustrating to have the beautiful voice of Eddie Dean, singing "San Antonio Rose," lost to the majority of the audience. Emcee Don Hinson and Gene Bear followed the program schedule; and the presentations from the government representatives were brief and to the point; but somehow the program bogged down with the microphone problems aggravating the situation. The honored guests added some bright spots to the evening when they accepted awards. Montie Montana Jr. ended his speech on  Wild West Show with this quip: "I'm sure glad (Supervisor) Ward made this presentation to me tonight because I just put in for my conditional use permit." Emcee Gene Bear not only received awards from the Chamber and statesmen, but a special presentation from Iron Eyes Cody for being so involved in humanitarian pursuits — most specifically raising money for Hope Ranch and helping on National Indian Day. The Chamber tried something new this year — and the move to larger quarters seemed to be a necessary step, but hopefully by next the Odyssey can work out the sound system bugs and serve a steak that isn't tough and cold! Our Country-Western celebrities and our ticket holders deserve better! JD8003: Download individual pages here. Collection of Jo Anne Darcy.